- Turmeric: Has powerful anti-inflammatory effects and is a strong anti-oxidant. It also prevents premature ageing. - Galangal: Has similar properties to ginger - it's high in anti-oxidants and used to aid digestion. - Lemongrass: Provides a rich source of vitamins and minerals, as well as being full of anti-oxidants. It is well-known for detoxifying the body, lowering cholesterol and treating insomnia through calming the muscles and nerves to help induce a deep sleep. - Chilli: Increases the metabolic rate and therefore helps to burn fat. It also reduces pain and inflammation. We love: It’s seasonal, bursting with flavour, not to mention all the health benefits too! We love: Izy’s soup in a jar is so quick and easy, and makes for a speedy light lunch at work! Change up the flavour base and toppings, or switch in some rice noodles! We love: Such a delicious, simple recipe to stock up on your greens! Tips: If you’re feeling naughty or on a cheat day, try adding a swirl of cream and some grated parmesan! 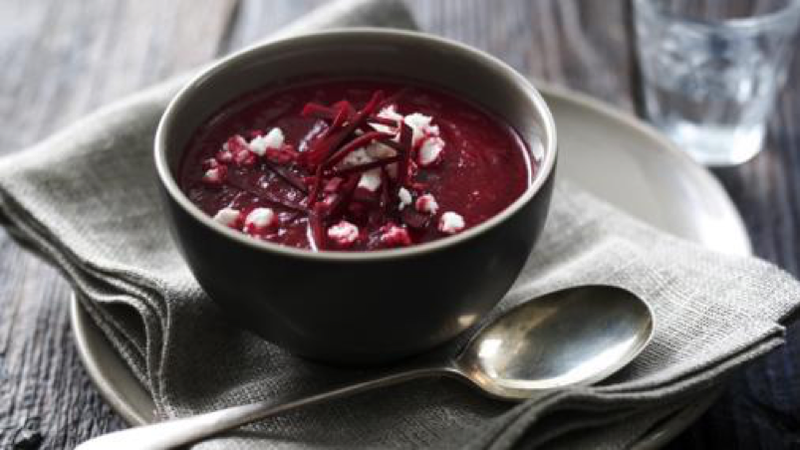 We love: The beautifully rich colour and earthy flavours from beetroot, which is also bursting with anti-oxidants, iron and folate. Beetroot has also been proven to lower blood pressure and improve exercise performance.